Ryanair launches first routes to Turkey: Dalaman from Bratislava and Dublin! Ryanair announced a major news today: the low-cost airline will launch first flights to Turkey! The new route will be operated to Dalaman in Turkey located on Turkish riviera, popular destination for holiday packages. The flights will be operated from Dublin in Ireland and Bratislava in Slovakia. 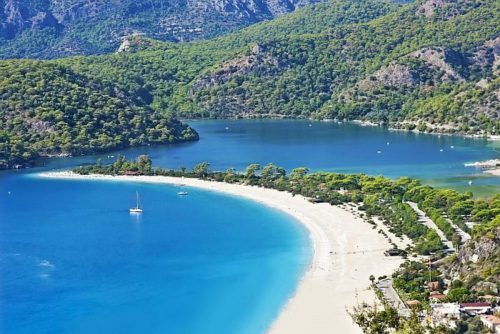 Dalaman is close to resorts oriented towns of Marmaris and Fethiye and there are also boat connections to nearby Greek island Rhodos. Popular Ölüdeniz Beach shown on the photo above is also located in the area. This is a first route to Turkey operated by Ryanair which may point to further expansion into this lucrative market. The flights will be operated from end of June from Bratislava and Dublin, in both cases once a week. The tickets are already available on Ryanair’s website for amazing price of just €79 per return flight! Let’s hope there are more new Ryanair routes to Turkey soon as it will bring welcomed competition and lower prices for all fans of cheap traveling!